The color, shape or the build quality? We’re conflicted about which attribute we like the most. Many of us are taken by the beautiful shade of rose gold. Then there are those of us who have fallen for the rose gold matching tube and pen stand. The old guard Lamy fans simply like the engineering that’s always in every Lamy. So which attribute attracts you? Better hurry up as this is a Limited Edition. The Lx is sold out and no more stock than what we received exists. We bought a large quantity but if you miss the Lx in rose gold, you will really have missed a chance to secure what we think is the best looking Lamy; ever. Lamy has added a new green Safari fountain pen, rollerball and ballpoint to the color pallet of this value oriented collection. Select from bright primary colors, fun rainbow tones, popular neons or basic black and white. Purchase an array so you can easily identify the color of ink inside. Or, choose the clear demonstrator option named Vista! Stock up on the appropriate Lamy refills shown below each pen option. Our customers have boundless affection for the Lamy Al-star and Safari for one simple reason; crazy value. Accept that these are designed to meet a price point and you’ll understand. Fun colors, rugged construction and as a bonus, a fun writing experience for very little money. Students love these as they are backpack friendly. Our most discriminating fountain pen buyers usually have a Lamy or more in their collection. Al-star fountain pen is ‘all about’ a great design matched with a high-performance fountain pen nib. The spring action clip allows for a tight grip on pocket on notebook. Lamy ballpoint writers pay attention! We have a colorful selection of refills for Lamy ballpoint pens. Although Lamy only offers black or blue, we offer 10 colors in Monteverde’s Liquid Ink which allows for a more fluid experience. The same ergonomic grip design used on the fountain pen applies to the rollerball. Al-star has a separate cap and cap posts on both. 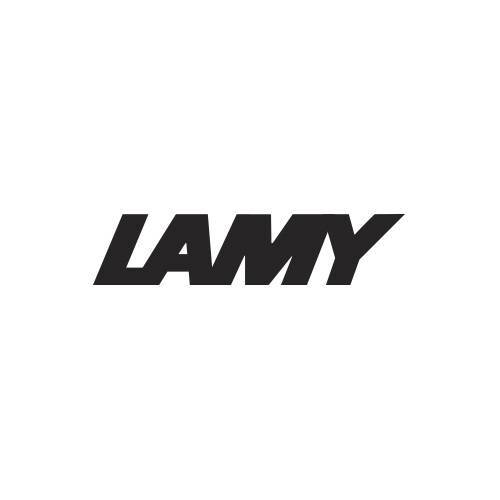 Picture a Lamy Studio fountain pen, rollerball or ballpoint in your hand. The brushed finish and sculptured design just look comfortable. The limited edition red and grey fountain pens lay ink to paper with a 14k gold nib. Brushed stainless, matte black or imperial blue covers the two-piece rollerball and standard fountain pens, as well as the one-piece, twist ballpoint. One of these Lamy Studio pens belongs in your hand. You'll see.